In an earlier article I talked about the new QuickBooks Messenger feature, which some people love and others hate. I provided a method that you could use to turn it off, which involved renaming or erasing a file. One problem with this approach – when you update to a new release, the Messenger feature would be restored. Good news! 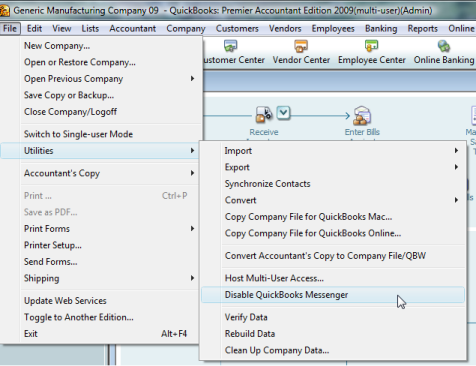 In the R4 and R5 updates of QuickBooks 2009 they have added a function that lets you easily turn this feature off. 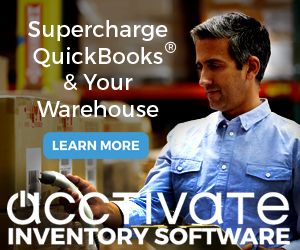 When you are logged in as the Administrator in multi-user mode you will find Disable QuickBooks Messenger as an option in the File/Utilities menu. Note that you must log out to close the Messenger feature, but when you log back in it won’t be started up. This helps – but it would be nice if they modified the QuickBooks Messenger feature to be more useful. 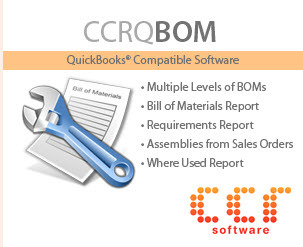 QuickBooks Errors (-6000, -83) and (-6177, 0), which plagued many people, have been repaired. 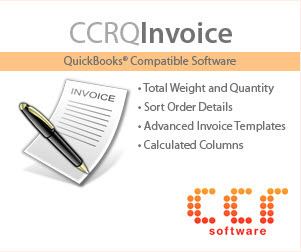 QuickBooks Online Banking has been improved significantly – althoug not enough for many users. These changes are very welcome, but I’m hoping that they can do much more. Mutliple bug fixes in the Accountant’s Copy feature have been implemented. Numerous fixes in the Multiple Currency feature have been implemented. I’ve been using this release for some time now and I highly recommend that everyone using QuickBooks 2009 update to this immediately. Press the F2 key when you have your company file open to see what release you are using. Thanks for the update on the messenger in QB! There are so many other messengers out there that people are already using, it’s kind of confusing that they’d feel it necessary to implement one (not to mention with no way to turn it off!). I assume this turns it off for the whole company? Is there any way users can selectively disable their own yet? Heidi: The setting would turn it off for the whole company. The renaming of the program file on an individual computer would turn it off for just that computer. I don’t mind the IM functionality since we don’t have any other IM’s in use. I just want to turn off the pop ups that tell when someone logs in. It changes focus of the pc and is pretty annoying. Any assistance there? Allison: As it stands at this time, you either have it all or you have nothing. They can’t turn off just some parts. Send them some feedback about that, maybe they’ll change it in the future. That messenger has been a thorn in the you-know-what, suspending Everything for up to a full 7 seconds, and when you have 12 people bouncing in and out of 4 companies all day this is a ‘virtual’ nightmare. So THANK YOU for the disable! Perhaps Intuit should make Messenger an OPTION rather than a default for the few customers for which this is a service. I truly think the messenger should be an individual option. That is the most aggravating feature I’ve ever come across. I really don’t care who is logging in and out. It stops my production when this happens. Steve, you should get an update notice in a short while (and it would be to a higher version, R5 is a couple of revisions in the past). If not, you can start the update by going to “help” then “update quickbooks” and clicking the “update now” button. Do this when you have some free time, as it may take awhile (not, for example, on “payroll day” if you use QB for payroll…). My boss, the admin, likes the messenger, but I have the same problems with it as everyone above. You said something about renaming the file for individuals. How do I get it off of my computer, bypassing my boss? I found the .exe file, but I can’t find a deny option in any security areas. Dare I hope there has been any update in the past year, either simplifying the disabling of this pest, or improving the individuals’ option of disabling it on their own pc? As mentioned, I also cannot find your instructions on disabling the individual’s pc use of this. My company’s admin also apparently likes this, but it is not mandatory that each individual use it, the admin just likes it for their own use (the rest of us have actual work to do). I haven’t seen any indication that Intuit will give individual users control over this, but they never announce what the are going to do in advance. You can disable it on a workstation by deleting certain files on that workstation, but that is a brute force method.